Trainer will make decision after fall next Sunday. 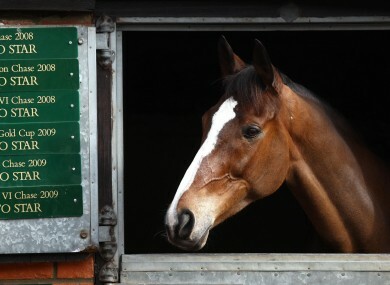 Kauto Star: rated at 50-50. TRAINER PAUL NICHOLLS reckons he might be able to make a call on Kauto Star’s Cheltenham participation next Sunday. The dual Gold Cup winner was expected to be the main challenger to his conqueror of last year, Long Run, when the Festival’s blue riband event goes to post in two weeks’ time. But a “pretty awful fall” on the gallops last week while being schooled by jockey Ruby Walsh has placed Kauto’s chances of travelling at ’50-50′. “This morning he had physio from 7-8am (he will be having twice daily sessions, in the morning and evening) and had an hour on the walker from 8-9am,” Nicholls wrote in his Betfair column today. “I must stress that he hasn’t taken a lame step since the fall. But like an ageing rugby player, Kauto takes a while to get over the knocks. That said, we will certainly keep him active. He will canter every day but we will not ride him out on Sunday, although he will have an hour on the walker in the morning and evening that day. “We will then step up his work next week, with a view to giving him a strong workout with Big Buck’s next Saturday. So we could well be in a position to make a decision on Cheltenham next Sunday. Email “Paul Nicholls still optimistic about Kauto Star's Cheltenham chances”. Feedback on “Paul Nicholls still optimistic about Kauto Star's Cheltenham chances”.